The first time I wrote a fan letter to an author, I was seven. 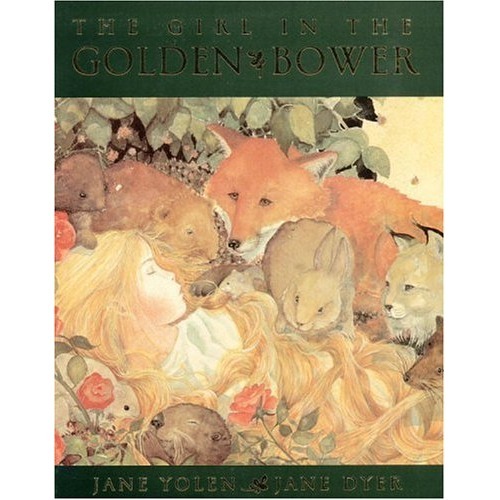 I wrote to Jane Yolen, author of over 300 books for children and young adults, and told her how much I enjoyed her book The Girl in the Golden Bower. I had read the book about thirty times, poring over the details and the beautiful language, before I actually got around to writing the letter. By that time, I thought of Jane Yolen as a kind of goddess. (She’s published 300 books!) I don’t remember exactly what the card said, but I remember I decorated the cover in wobbly letters that read “Good Job!” That was one of the encouraging phrases that showed up on the stickers my first grade teacher stuck to my homework. At the time, I had recently learned how to draw stars without the help of an outline, and so I penned sloppy little stars all over the place. I didn’t expect a response at all; the entire purpose of writing to her was to let her know that I had become obsessed with her book. But in a few weeks, I received a very kind letter from Jane Yolen herself. I was ecstatic. I couldn’t believe that the brilliant author I had deified in my mind had actually read my letter and responded! Over the years, I have written to a handful of writers I deeply admire, and every single one of them has responded. Most recently, I wrote a letter to Joy Williams telling her that I enjoyed her collections Honored Guest and Escapes. A week later, I received a beautiful postcard in the mail from her, thanking me for the letter and asking me about the creative writing program at UCSC. Reading her note completely made my day– and it reminded me that it’s always, always, always an excellent use of time to write a kind letter to someone and let him or her know that you loved their story. Sometimes, life gets really busy, and I don’t write as many letters, period. Finding time to write letters of appreciation to authors can be especially difficult. But I’m going to make more time for it, because it always makes me happy to tell authors that I appreciated their work.